A reader named Julia has asked a great question. The answer deserves a blog page all to itself. The simple answer, Julia, is that Louis Wagner lied. There was no other boat and he did not bait trawls for another fisherman. The comment was part of Wagner's elaborate and entirely unsupported alibi designed to explain where he was during the 11 missing hours that he rowed to Smuttynose Island, killed Karen and Anethe, and rowed back. Your question goes right to heart of one of Wagner's many lies and to the heart of the murder itself. 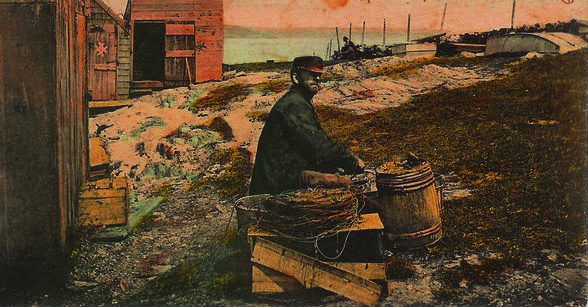 The men from Smuttynose were "tub trawl" fisherman. Instead of baiting only a few hooks as traditional fishermen had done for centuries, John Hontvet could set up to 900 hooks at a time on lines that were laboriously baited, then curled into tubs. This new high-tech system was the key to why Hontvet's fishing aboard the schooner Clara Bella was successful, while independent fishermen with smaller boats were going out of business in 1873. John was "forehanded," in Wagner's words, or highly successful due to careful planning. That is why Wagner targeted the Hontvet clan for a robbery that turned into murder. Wagner was broke, frustrated, and jealous, and he knew the island home intimately having lived there the previous year. Hontvet was not only making money while other fishermen were failing, but he had saved up at least $600 to buy a newer bigger boat. This was a kingly sum to Wagner, who probably earned little more than $200 a year at his dangerous and difficult job as a dory fisherman. 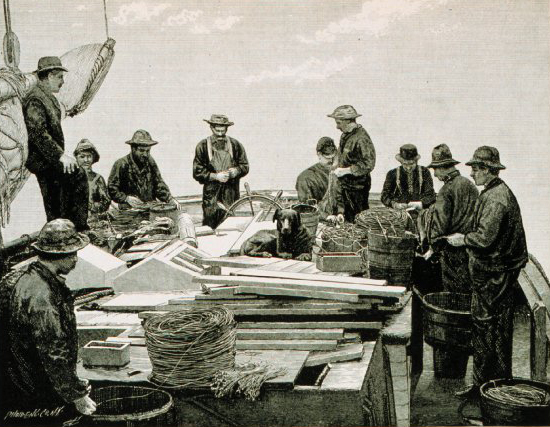 Trawl fishing was new and required huge amounts of bait, more than could be provided locally. So special suppliers in Boston were needed to ship up enough shellfish or "poagies" or other bait to fill 900 hooks in a single night. Wagner knew that the train with the bait was late and he knew that it would then take John and Ivan and George Lowd hours to bait the trawls at Matthew Johnson's shop on Water Street. He knew that he had time to row to Smuttynose and back and that at least two women were sleeping alone on the island. Wagner told John he would be back to help bait trawls, but then did not return as promised. According to his false story, Wagner ended up on another boat baiting trawls. In court Wagner could not remember the name of the boat, the name of the captain, or the wharf where the mystery boat was docked. He said no one else saw him and claimed that the captain, whom he barely knew, paid him in advance in cash. Wagner claimed that he baited 900 hooks by himself -- in less time than the three other men took to bait trawls for the Clara Bella. Where he got the bait he could not say. He then had time that same night to go drinking, pass out by the town pump, and return to Johnson's boarding house -- all before Hontvet's crew was finished baiting their hooks. John Hontvet said he went looking for Wagner when it came time to bait the trawls. He walked up and down the piers on the waterfront a number of times. He could not find Wagner and he saw no other trawl fishing boat. That's because there was no other boat. And had there been, that captain too would have had to wait for enough bait to supply the 900 hooks that Wagner said he baited. You'll find my quick summary of the trawl fishing business in a chapter in MYSTERY ON THE ISLES OF SHOALS called "On Water Street." Anyone interested in a scholarly and detailed explanation should read W. Jeffrey Bolster's award-winning book THE MORTAL SEA. Jeff offers a close analysis of why the local fishing stocks were depleted during that time period and how the rise of the controversial new practice of trawl fishing made an impact on the fishing industry. (c) 2015 J. Dennis Robinson. All rights reserved.